Introducing the most impressive Razors SL color-way to date, the mint. The SLMint offers a comfortable, quick ride - perfect in both street and skate park environments. The SL is the only boot on the market to offer a complete baseless design, delivering increased contact with grinds, lower center of gravity and a drop in overall weight, all while maintaining long lasting support. Each piece of the SL skate is full replaceable, from the cuff-to the buckle-to each piece of the soul frame, including Razors’ patented backslide plate. The Mint has improved hardware and axles that help eliminate the annoying stripped bolt. It also comes with a comfortable and streamlined, reformed Razors liner allowing more precise fit options with half sizes 7 ½ , 9 ½ & 10 ½. The lightweight, hard-shell boot comes complete with a classic Razors cuff&buckle, & reformed Razors liner. 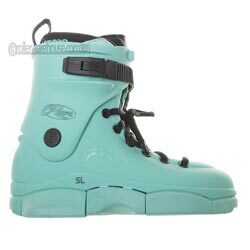 The SL Mint is a perfect ride, right out of the box, and proves durable and supportive, session after session.